1. 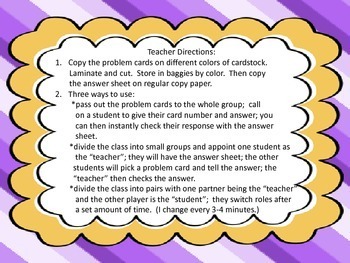 Pass out the problem cards to the whole class. 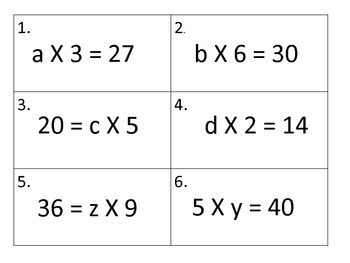 Call on a student to tell you the card number and the answer. You can instantly check the response with the one page answer sheet. 2. Divide the class into small groups. Designate one student as the "teacher". That child holds the answer key and the other students randomly select problem cards. They tell the "teacher" the answer and it is easily checked on the answer sheet. 3. Partner up students and they play with one being the "teacher" and the other being the "student". I have them switch roles every 3-4 minutes. 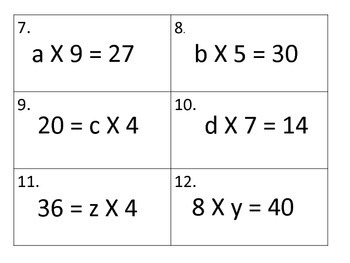 Have some multiplication tables on hand for the students to use as a tool to find the missing factor. Be sure to browse through my store to see what other items I have available to help meet the curriculum needs of your students. Just follow me to receive notifications of new learning materials I am creating for your classroom and mine. All digital downloads are 50% off during the first 48 hours.